Australia's most awarded Mercedes-Benz retailer proudly presents this Certified low kilometre 2017 Built & Complied GLA180 featuring Fully-Factory-Backed Warranty right through to April 2022! Perfectly presented in crisp Cirrus White coachwork with 18-inch 5 twin-spoke alloy wheels, Garmin MAP PILOT navigation, Reversing Camera with dynamic guidelines, Bi-xenon headlamps, Blind Spot Assist, KEYLESS Start, and EASY-PACK tailgate with electrically operated opening and closing functions. 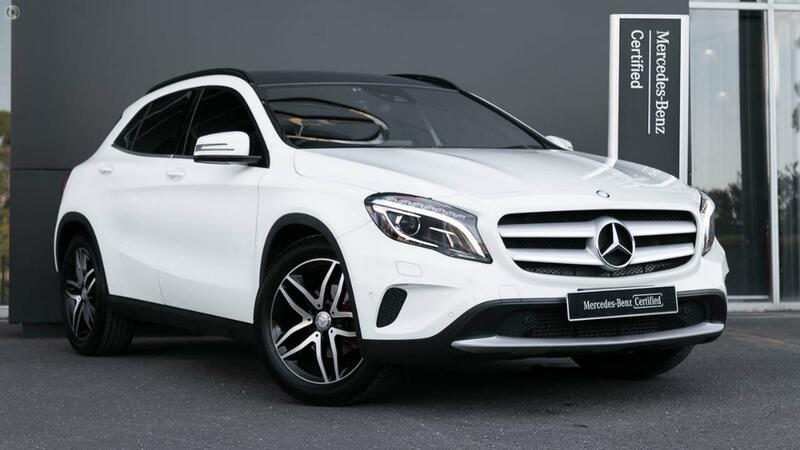 Take the wheel of your incredible Mercedes-Benz GLA180 SUV with absolute confidence - ONLY from a Certified Mercedes-Benz expert and the reigning "Mercedes-Benz Metropolitan Retailer for the Year" again, for the 5th time in 6 years! - Windscreen wipers with rain sensor and 1-touch wipe function. - Twin louvre radiator grille in silver with chrome inserts. - PRE-SAFE accident anticipatory system.